Corky Trewin began his journalism career as a part-time sports correspondent to the local Redmond weekly newspaper as an eighth grader covering the Redmond Jr. High sports teams beat. Two years later he appointed himself sports editor and made photographs to accompany the articles. As a junior at Redmond High School, he was hired by the Seattle P-I sports editor John Owen to work weekends as the sports copy boy, i.e., running errands, tracking the sports wire ticker tape, and preparing the columns of sports scores for the back page. After graduating from Redmond High School in 1972, Trewin received a journalism scholarship and enrolled at the University of Kansas majoring in journalism at the William Allen White School of Journalism. Within one week on campus, he became the first KU freshman to serve as a school newspaper staff photographer. The following year, KU assistant athletic director Gale Sayers hired Trewin as a recruiting photographer to prepare pamphlets and photographic pieces to send to prospective athletic recruits. That led to the position as the KU athletic department’s sports action photographer and travel with the football, basketball, baseball and track teams throughout the Big 8 for three years. In 1975 while Trewin was still at KU, a local Seattle ownership group, headed by the Nordstrom family, was awarded a National Football League franchise. Trewin promptly wrote to newly hired General Manager John Thompson to apply for the position of team photographer. Thompson replied that the team was not ready to hire a photographer at that time, and thanked him for the interest. Following graduation in 1977, Trewin re-submitted the letter of interest, this time in person, to Thompson and was told again there was no job. In 1978, Trewin asked for and was granted Seahawks sideline credentials basically trying out for the team as a “free agent” photographer. In 1979, he was retained by the Seahawks as the team photographer as well as the photographer for the Norm Evans Seahawks Report, a weekly magazine devoted to the Seahawks. In 1980 Trewin was hired by the Seattle Mariners as team photographer, and then became the Seattle Super Sonics team photographer in 1984. He has worked for the Seattle Sounders, Tacoma Stars and Seattle Thunderbirds as well as the University of Washington Athletic department. He has photographed 16 Super Bowls, five Final Fours, two Olympics Games as well as the Moscow and Seattle Goodwill Games. 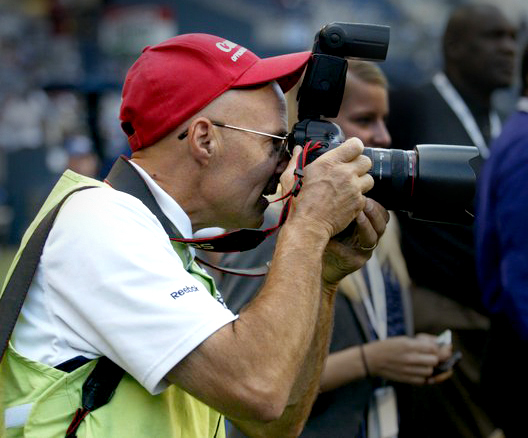 Currently Trewin is the team photographer for the Seahawks and the Sounders FC as well as a local event and college, high school and youth sports photographer. Corky, looking forward to seeing many more of your great photo’s & many more years on the sidelines. You are the KING, Gary sec113….LET’s GO SEAHAWKS!!! Corky – My name is Bob Casazza. You can check out my professional credentials on Linkedin. Years ago (1972) I painted a Washington Redskins piece using photos of Richard Darcy. He was the sports photographer for the Washington Post. I’m on a personal mission to paint some of the best NFL paintings/illustrations ever created. I want to do this before time runs out. I’ve live in Seattle and worked in Seattle since 1994. I want my next series of painting to be about the Seattle Seahawks. Can we discuss how I can use some of your…the teams photos? I do understand the business rights. I can show you sample of my work. Amazing show of determination and passion. As a “starting out” photographer, featured photographer for Wesco Athletics I’m continuing to learn, grow and foster my passion. You and Rod along with Robert Beck are talents I admire and hope to become as great as. Have a blessed New Year! I am really impressed by the quality of your work. Yes you may and this works fine for a conversation about that. I am a Canadian living in London, UK. You can reach me at fmorin@harriswilliams.com so that we can arrange for a time to speak. Just got back from the Canon event at the Lynnwood Convention Center. I only went to hear you speak and am very appreciative of the information you shared. I love sports photography and it was an honor to listen to the tips and techniques you shared with everyone. Thank you for taking the time to help inspire me! I worked many games in the Kingdome over the years and remember a very large fish eye lense print taken during a game (i think it was a Hawks Raiders game) where I happen to be standing on the sidelines. It was displayed in the press area. If you remember the photo are there prints available?